NATO and Russia have agreed to restart their military relationship, nearly a year after it had been frozen over the war in Georgia, the top NATO official said on Saturday. “The NATO-Russia Council is up and running again also at the political level,” said NATO Secretary- General Jaap de Hoop Scheffer, speaking at a meeting of ministers in Corfu, Greece. Russia is not a member of NATO but is a member of the NATO-Russia Council, formed in 2002. It consults, coordinates, reaches joint decisions on and carries out joint action with NATO on areas such as terrorism, cooperation on Afghanistan and military exercises. 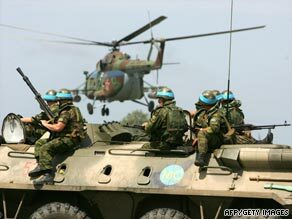 Russia and Georgia fought a five-day war in August 2008 over the breakaway Georgian province of South Ossetia — the first time Russia sent troops abroad to fight since the fall of the Soviet Union in 1991. Differences over that conflict and Russia’s subsequent recognition of the breakaway Georgian regions of South Ossetia and Abkhazia strained relations between NATO and Russia. While there are differences of opinions regarding Georgia, Scheffer said member states “share common security interests,” including stability in Afghanistan, arms control, nonproliferation of weapons of mass destruction, and concerns over drug trafficking, piracy and terrorism.